First thing’s first, if you already know you love psychological thrillers and are not squeamish about blood, I recommend starting “The Promised Neverland” as blind from any more information about the anime as you can be. But if you need more convincing than the first sentence in this review about “The Promised Neverland,” let me convince you to watch it. Every Thursday at 1:25 p.m. CDT, “The Promised Neverland” aired a new episode on the Netflix-but-for-anime streaming service, Crunchyroll. The finale of season one has since aired. It follows the story of three orphans, Emma, Norman and Ray at Grace Field House where children are always automatically adopted by their 12th birthday and sometimes as early as their sixth birthday. Every day, Emma, Norman and Ray along with other orphans, live a life of peace with freshly cooked, nutritious meals, plenty of playtime and opportunities to foster their intellect under the guidance of Mom, the caretaker of all the orphans. Everything is wonderful for the lives of the children until they discover the truth of what happens to their adopted siblings – they are killed and raised as livestock for the consumption of demons living outside the walls of Grace Field House. 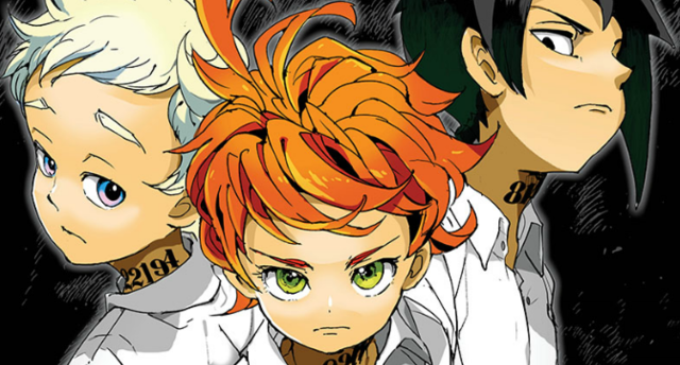 “The Promised Neverland” is the story of Emma, Norman and Ray trying to figure out how to escape their foretold deaths. Each episode, the viewer is unsure of who really is the enemy. Is there a traitor? Is Mom really the kind woman the children were raised to love? Every question answered leaves more questions in its place, making the viewer of this magnificent show look forward desperately to the next episode. It is a struggle every week to not go ahead of the anime and read “The Promised Neverland” manga. As of right now, there are 11 episodes that have aired and I would not doubt that if a new viewer were to start watching it today, he, she or they would have it binged in at most two days regardless of how much he, she or they needed to study for class the next day. At first, I disliked the opening song, “Touch off” by UVERworld, but now I believe its stereotypical edgy sound contributes to the edgy plot itself and it is optimal to watch and jam out to the intro song before watching every episode. Unlike many anime opening songs, the full version of “Touch off” has even found its way to Spotify for any “The Promised Neverland” fan to listen to whenever he, she or they crave the new episode. This brings me to the animation of “The Promised Neverland.” Sure, anime can have a unique plot and a catchy song, but poor animation can take the audience out of the moment, leaving the anime to be unsatisfactory. “The Promised Neverland” kicks poor animation to the ground with its occasional first person perspectives of the children investigating that pulls the audience into the show, the moment and the type of extreme amounts of suspense that cause people to let out a big sigh because they did not realize they were holding their breath for the characters in the first place. Every visual along with the animation is breathtakingly beautiful and even makes the scenes where sedimentary characters are simply discussing what to do next in their situation interesting. The only criticism I can find of “The Promised Neverland” is there are some plot holes – such as how are the children at only the ages of 12 and under already so articulate and able to think so critically. However, I personally believe this could be one of the aforementioned questions that still are not answered specifically yet. There is no doubt that “The Promised Neverland” is one of the best airing shows this season with its unique and interesting plot, great opening song and superb animation and if an opportunity presents itself to be able to watch “The Promised Neverland” I highly recommend you do so, unless you did not plan on binge-watching a show that day.